Numerous reports have stated that Microsoft is preparing to launch a smaller, 8-inch version of its Surface RT tablet. This looks more likely after Acer announced the world's first 8-inch, Windows 8 tablet. 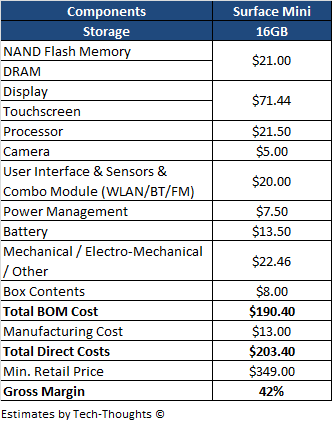 As we did before for the iPad Mini and the Surface RT, let's estimate the BOM cost and likely price of the rumored device. Memory - The memory specifications listed above would be the same as that in the 16GB Nexus 7. For the Nexus 7, this cost totaled to $21.00. However, this estimate is dated, so we will need to make some adjustments for the total cost. Display & Touchscreen - The cost of the display and touchscreen is primarily dependent on the screen size and display resolution of the device. Therefore, the cost per sq. inch. per pixel should be roughly consistent. This figure works out to about $0.014 for the Surface RT and about $0.016 for the iPad Mini. Using the figure for the Surface RT, with our assumed display resolution, we get a total cost of $71.44 (lower than that for the iPad Mini). Processor - The original Surface RT used an nVidia Tegra 3 processor that cost $21.50. I've assumed the same cost for the Tegra 4 processor. The actual cost may be a a little higher as the Tegra 4 has not been on the market as long as the Tegra 3 was during Surface RT launch. Camera, User Interface, Sensors & Combo Module - I have assumed these costs to be the same as they were for the Surface RT. Battery & Power Management - A 16.7 Wh battery (same as the iPad Mini) costs about $13.50, i.e. roughly $0.81 per Wh of capacity. Mechanical / Electro-Mechanical / Other - The biggest cost driver of this component is the casing, which primarily depends on the size of the device. Using an Area ratio with the component cost from the Surface RT, I've estimated a figure of $22.46. Box Contents - iSuppli's teardown showed that the Surface RT had box contents that cost a total of $25. However, this included the keyboard cover which cost $16-$18. It may be safe to assume that the Surface Mini keyboard cover (if it has one) will be sold as an optional accessory. This implies that the cost of box contents would be roughly $8.00. 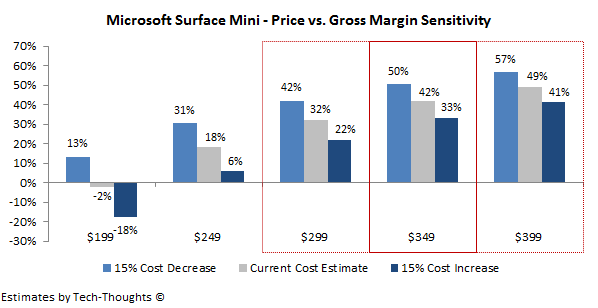 Manufacturing Cost - I have assumed the same manufacturing cost as the Surface RT, i.e. $13.00. Cost Adjustments - Costs of semiconductor components are quite sensitive, while costs of other components are more or less static. Therefore, even a sharp change in the cost of one of the components shouldn't have a drastic effect on the total BOM cost. As I've stated before, I expect the actual BOM cost to fall within a 15% range of the total $203.40 figure. Microsoft is under pressure to ensure that the pricing is in line with Windows RT products from other OEMs, which face the disadvantage of having to pay for the OS license as well. With OEM interest in Windows RT already very low, Microsoft cannot afford to undercut their last few partners (like Dell). However, even if Microsoft brings down the Windows RT license cost to $20, OEMs would need to price the device well over $300 to make a gross margin of just 30%. I would consider this the absolute floor of the potential price range for the product. Microsoft sold the original Surface RT at a gross margin of roughly 47%. A similar gross margin for the Surface Mini would imply a price of $399 - this would be the high-end of the potential price range. Since smaller tablets usually carry lower margins compared to ~10 inch devices, $349 may be the most likely price.